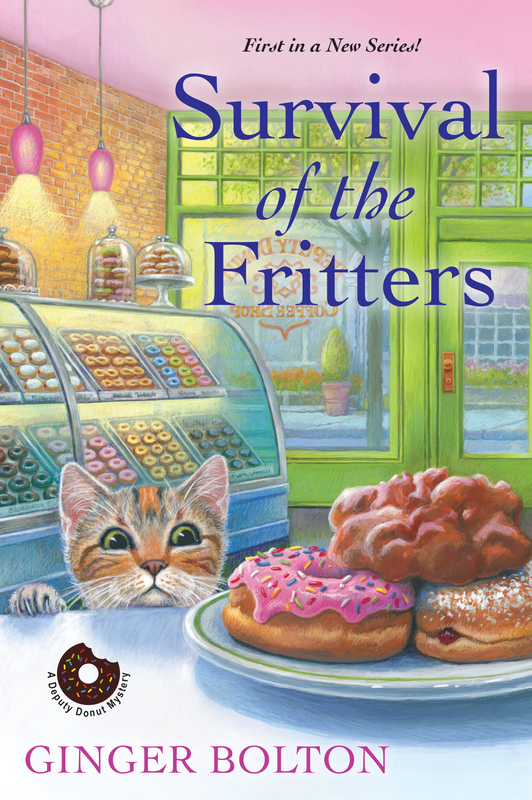 Survival of the Fritters is the first installment of a new cozy series by Ginger Bolton. Emily co-owns Deputy Donuts (named after Deputy Donut, her cat), and when one of her regulars is murdered, Emily decides to find out why. This is a good start to a new series, with enough introduction and backstory to make you want to know more about the characters, and a great plot to boot. I’ll definitely be watching for book number two. 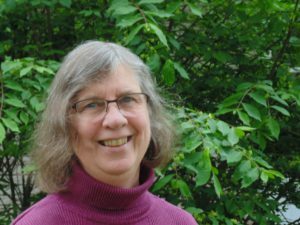 We’re fortunate to have a guest post from Ginger Bolton today. Please join me in welcoming her – and be sure to leave your comments for her below! In SURVIVAL OF THE FRITTERS, Emily Westhill and her father-in-law Tom brew delicious coffees for the people who come to Deputy Donut to enjoy coffee, donuts, and gossip. Emily and Tom love coffee and donuts. I’m sure I loved donuts from that very first taste of sweet, deep-fried goodness. Coffee, however, was another matter. The smell of the ground coffee in the freshly opened can made us kids want to try coffee. We weren’t allowed to drink the grown-up beverage. Veiled threats regarding the stunting of growth were uttered. Finally, when I was in high school, I was deemed old enough (or tall enough) to try coffee. Or maybe my begging wore down my mother’s resistance. In those days, if we had company, my folks hauled out the gleaming electric percolator. For everyday, though, they brewed coffee in a banged-up aluminum percolator on the stovetop. They were careful not to waste the ground coffee they bought in huge cans, so they didn’t use much, and then they perked it until the liquid bubbling into the glass knob on the lid of the coffeepot was the correct shade of lackluster, almost transparent brown. On the day that my mother capitulated and let me try coffee, the brew had been in that coffeepot on the unlit stove for a long time. In an attempt to make my first taste of coffee appealing (or something) my mother doctored it with about a half cup of milk and several spoonfuls of sugar—we both knew that I liked sugar. The end result was tepid, sweet milk with an acrid tinge. I didn’t try coffee again for a long time . . . Finally, I did. My parents, aunts, and uncles perked their coffee in strengths varying from paler than the palest teas to transparent, medium brown. I drank it at family gatherings mostly to show I was grown up. I added milk, but never sugar, never again. In college, I made do with sticking an immersion heater in a mug of water, boiling the water, removing the immersion heater, and plopping a teaspoon of instant coffee and some whitener into the hot water. Even the thought of the fuel that kept me awake nights then could keep me awake nights now. And then I had my first cup of drip coffee. That was it. I bought a cone-shaped filter holder. I still used canned ground coffee. Pouring the right amount of water into the pot at the right speed was, well a challenge. It didn’t overflow very many times, but still . . . Eventually, I treated myself to an electric drip coffee maker and a coffee grinder, and now I mostly brew strong coffee, which I usually drink black. It’s close to swoon-worthy. A burr grinder set to medium. Blade grinders chop the beans into assorted sizes, making it difficult to control the strength of the brew. Follow the manufacturer’s instructions and experiment with the size you grind the beans and the amounts of coffee and water until you develop a brew that’s right for you. Do you remember your first donut? Your first taste of coffee? Was it love at first bite, or . . . ? ? ? What are your favorite tips for making coffee? And if you’ve made mistakes with your coffee-brewing, please tell me. You’ll make me feel better about my own disasters. Be sure to enter the Rafflecopter giveaway for your chance to win an awesome Deputy Donut prize pack, including a hand-crocheted skull scarf, a $25 Amazon gift card, and more! I first tried coffee age five. NASTY! My older brother (age seven) loved it. Grandma gave each of us some with milk and think some sugar. She was watching us when we had the chicken pox. Right before Easter. I had just finished making Easter basket in kindergarten. Don’t remember my first cup of coffee but I know I never cared much for it until I started drinking it black. I do like some of the flavored coffees. This is an interesting looking book. Love the cover. I need to put it on my list to read. Thank you! I was like you, needing to figure out what to put into it so that I would like it. I don’t remember my first donut, but I remember drinking some of my Dad’s coffee when I was probably still in grade school. Interesting post on making a good cup of coffee. Do you remember if you liked your dad’s coffee? When I was 14 I started working at the City Market at a meat booth. I was picked up at 5:00 in the morning. They always a huge coffee urn going so I finally broke down and started drinking coffee. Milk only. I can’t believe I used to drink instant. I do no grind my own beans, but do use a drip machine. I think almost anyone would have succumbed to that huge urn of coffee. And I drank instant for a long time! Thanks. I learned a lot about coffee today. Your piece got me thinking about my first donut, and I was startled to realize I don’t remember it.